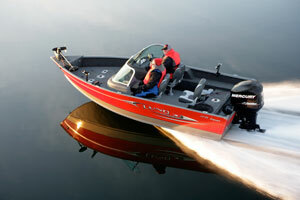 A well-designed windshield and available aft seating enhance the versatility of this fishing-first runabout. 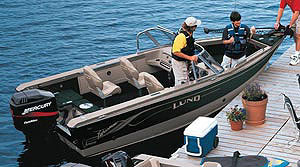 The Lund 1775's 27-inch-deep aft cockpit offers security for smaller anglers. Dual molded consoles and a tall, walk-through glass windshield distinguish the 1775 Impact Sport from the 1775 Impact SS, which has a helm console and smaller plastic wind deflector but is otherwise identical. 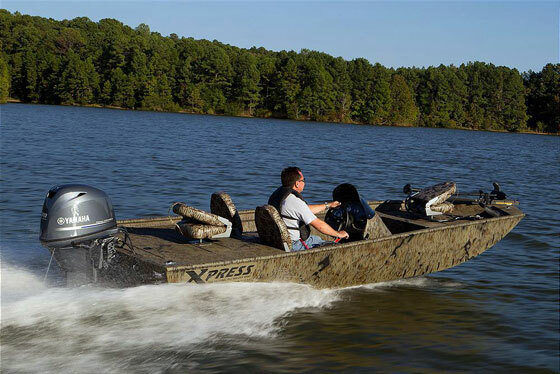 The Sport version costs about $1,300 more than the SS, starting at $19,295 with a 90-hp Mercury two-stroke outboard motor. The SS with the same motor is $17,995. A central rod locker can swallow six seven-foot rods and four six-foot six-inch sticks—and the hatch locks for security. In each case, the price includes a Shorland’r trailer with a swing-away tongue. Note that at this price you are getting standard two-stroke motors, not direct-injection Mercury Optimax models. These two-strokes are no longer in production due to tighter emissions regulations, and when the limited remaining supply is gone, so is this nice, low price. These motors also require a 20-inch transom. 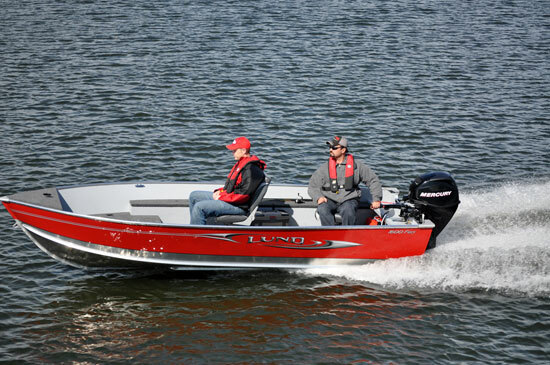 I ran the 1775 Impact with a 90-hp Mercury Fourstroke, which hangs on a 25-inch transom, and has a base price of about $22,600. 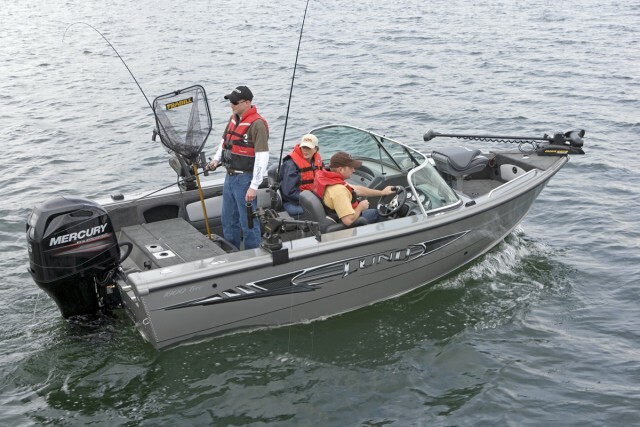 The higher transom offers a little more security aft, and the four-stroke motor is certainly quieter, cleaner, and more fuel efficient than the old-school two-stroke. I clocked this boat at 44 mph with a stainless steel prop and a very light load on board. 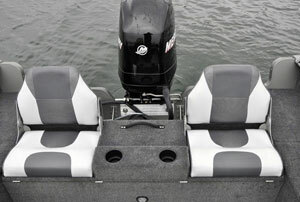 This optional aft seat offers secure comfort for two passengers, and flips over to create an expanded casting deck. 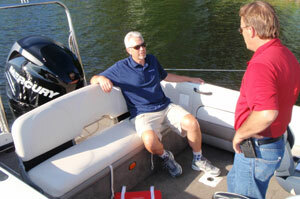 My test rig was also equipped with the optional rear seat ($535) and I would not buy this boat without it. You get two fixed seating positions at the transom, each with a hinged back so they can be folded for trailering. These seats will be especially nice if you head out with kids aboard, because they’re fairly low, adding security in a boat with an already generous cockpit depth of 27 inches. The seats don’t swivel, and they place passengers close to the helm seat. You can also sit in these seats and fish over the side of the boat. 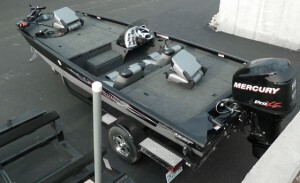 When the kids are not along, the entire seat base flips forward into the cockpit to create an aft casting platform, with a socket for a portable seat and the aft 18-gallon bait/livewell close at hand. 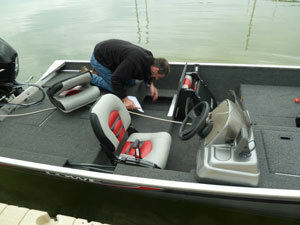 The disadvantage of the optional seat is that when it’s folded up, it covers the livewell. 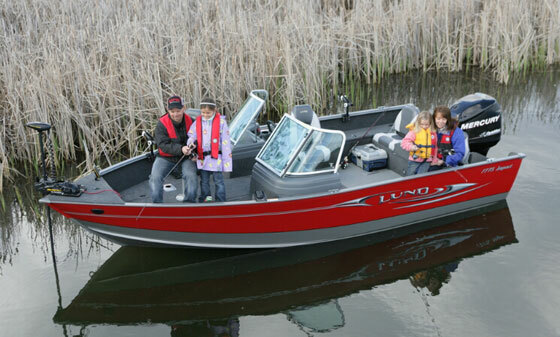 The Lund 1775 Impact Sport comes with a tall windshield mounted on elevated consoles that offers good wind protection on chilly mornings. 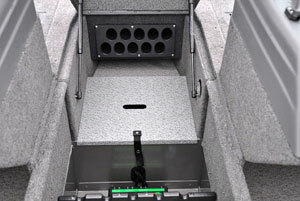 There’s an alternate location for those keepers, however—in the 12-gallon livewell located in the bow casting platform along with two other storage compartments. A hatch in the center covers a serious rod locker, with tubes for 10 rods, and racks that support the handle end so the reels can dangle. 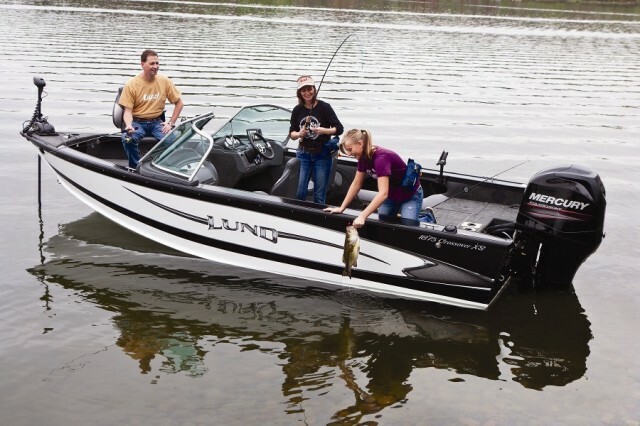 This locker set-up is an example of the Lund “fishing-first” philosophy—its boats are designed by pros, and the company regularly seeks input from customers in the field. I found good legroom at the helm console, which places engine instruments high in a pod and has a nice flat area outboard for fishing electronics. A row of switches sits on an angled panel to the right of the wheel. On a chilly, windswept day, the tall windshield protected me from spray, and I could peek over the top for a clear view even after the glass was wet. If there’s an issue with the helm, it’s the sharp edge on the molded-plastic wheel that dug into my fingers. The port console incorporates a deep glove box. The treated plywood deck is covered with easy-to-clean vinyl in the cockpit and carpet on the casting platforms. The gunwales are compatible with Sport Track accessories, a system that permits installing portable rod holders, tool holders, downrigger brackets, and more that clamp to the boat and can be removed or relocated with ease. Those are extras, of course, as are an electric trolling motor, and electronics, which are dealer-installed items. We’ve grown used to seeing these items as standard equipment on some other boats. There’s a lot of riveted aluminum in this deep-V Lund, especially in the bottom, which is double-plated from the bow to midships in traditional Lund fashion, for added strength and durability. This is a solid boat. You may buy it for fishing with the kids and have it so long that you’ll be fishing with the grandchildren.